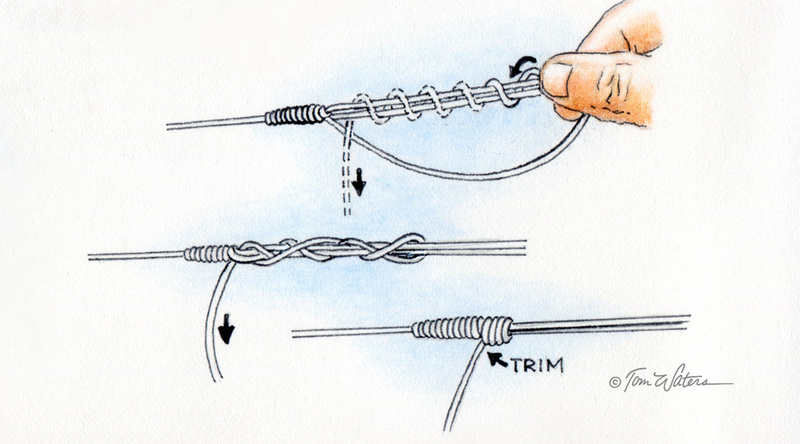 When properly tied, the Bimini Twist is stronger than the original rated breaking strength of your fishing line. 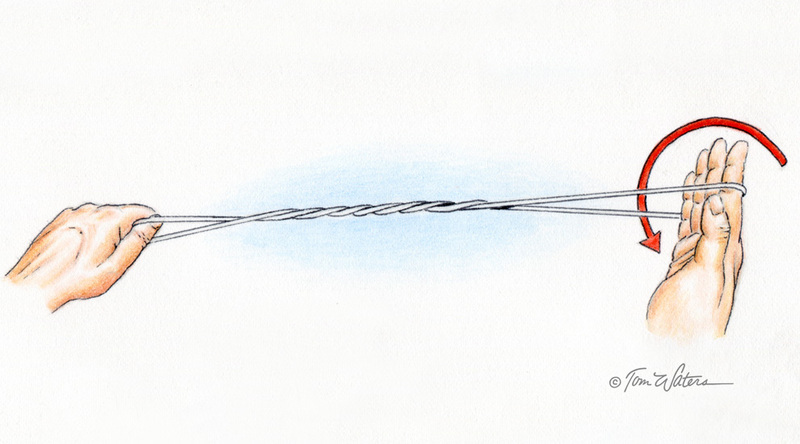 The Bimini is the primary knot used for making double lines in offshore trolling applications. It is also used to fashion shock leaders for casting, fly leaders, or as a connection for attaching swivels. 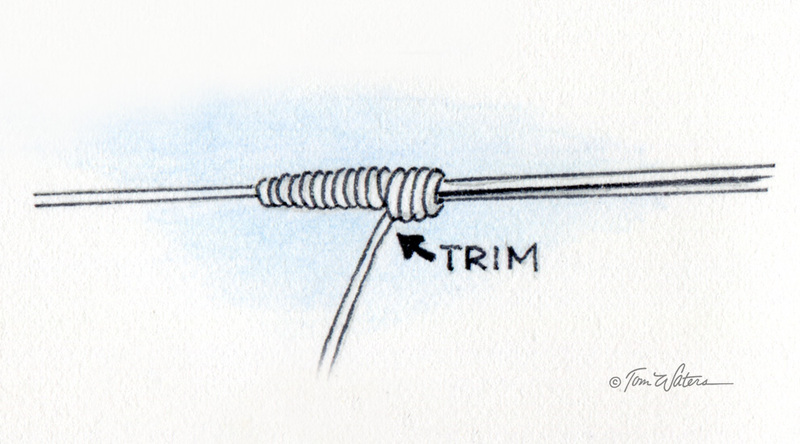 The following directions are for creating a double line of five feet or less -- two people are usually required when tying a 15- to 30-foot Bimini (IGFA-compliant) double line. 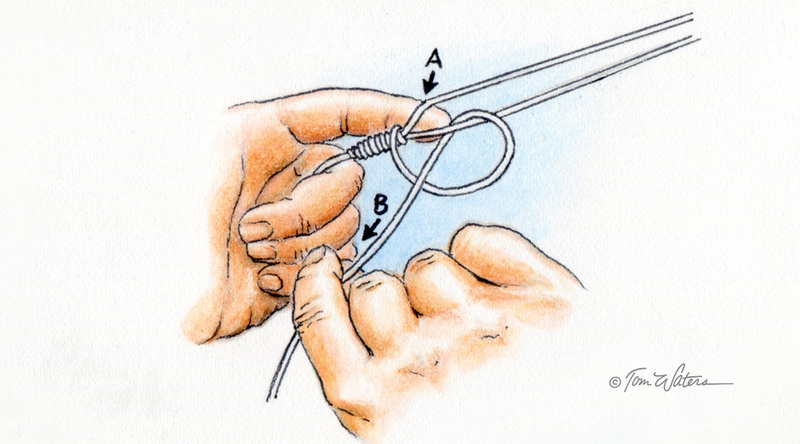 A lot of practice is required to tie this knot correctly, but those who become proficient can tie a 20-turn Bimini Twist using mono in less than a minute. Illustrations by Tom Waters. STEP 1: Measure a little more than twice the length of main line you'll want for the desired section of double line. Then, double the tag end of the length back against the standing part to form a loop. Hold both the tag end and the standing line firmly with the left hand, while you slip the four fingers of your right hand in the loop. Separate your hands to keep the loop tight. Then, rotate your right hand 20 times (30 or more times if your main line is braid) in a clockwise direction. STEP 2: Prop up your right foot to bend your knee. Slip the loop in your right hand over your knee, keeping the line tight with your left hand so the twists don't unravel. Separate the standing part of the line (left hand) from the tag end (right hand) so they form a 90-degree angle. Pull the tag end and standing section of the line toward you evenly, maintaining tension and a 90-degree angle. The twists will tighten and draw down towards your knee. STEP 3: Once the twists are tight, shift the position of both hands to the right, keeping the 90-degree bend. The standing line should now be inline with the twists and the tag end at a right angle to them. As you pull on the standing part with your left hand, the tag end in your right hand will start to feed over the twists. Maintain moderate tension, but allow the line to feed (A). 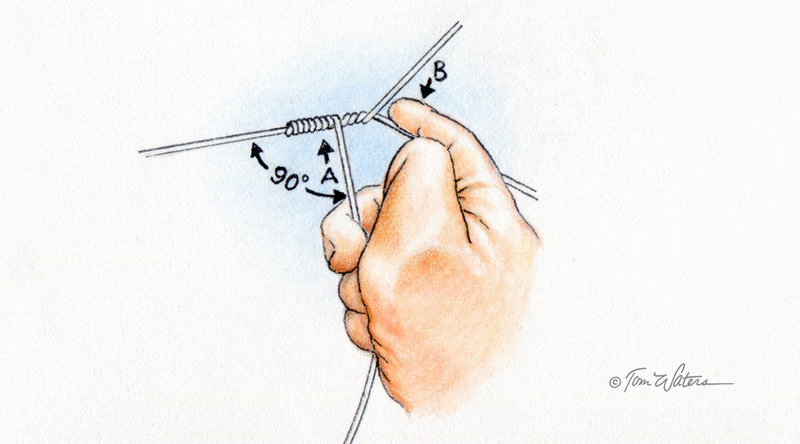 Place the forefinger of your right hand inside the loop and pull toward you to help the tag end feed smoothly (B). STEP 4: When the wraps over the twists reach the junction of the loop, hold them against the twists with the forefinger of your left hand (A). Make a single half-hitch with the tag end around the right leg of the loop and pull the tag end (B) until the half-hitch seats. You no longer have to maintain tension and may remove the loop from your knee. NOTE: With braided line, consider tying a half-hitch or two around each leg of the loop, followed by two to four half-hitches around both legs. STEP 5: To finish the knot with a locking hitch (uni-knot), hold both legs of the loop together with your right hand. Lay the tag end against both legs, leaving enough slack underneath to form a small semi-circle. Wrap the tag end around both legs of the loop five times, passing each turn inside the loop. Moisten the wraps, then work the tag end back toward the twist slowly. You may have to use the thumb and forefinger of your right hand to draw the wraps back repeatedly as you tighten so that they don't jump over the knot. Draw the locking hitch down as tightly as you can (use pliers if necessary) and trim the tag end a 1/4-inch from the knot.